It was a long time coming—longer than the gap between the announcement of the iPad 3 and the iPad 4—but Electronic Arts has finally released another military shooter. The game is called Medal of Honor Warfighter. It's EA's first military shooter since 2011's Battlefield 3 (we're not counting this past winter's sci-fi first-person shooter Syndicate). They make a lot of these kinds of games. Before MOH:W and BF3, there was, of course, BBC and AO2. Some may say that military shooters are inherently bad. They're not. Some might say this is all EA does. Not true! They also make Dead Spaces, FIFAs, SimCitys and a whole lot more. But who would dare accuse them of neglecting the military FPS? No one. Coming next year from EA: Battlefield 4, another Army of Two and *maybe* whatever the former creators of Medal of Honor and Call of Duty are cooking up next. Plus: Crysis 3, but we're not going to count that. What about EA's rival, big bad Activision? We won't count their James Bond FPSes. We didn't count EA's either. (You know, we didn't count EA's sci-fi shooter Crysis games, either. Ditto: Bulletstorm since it was a space-pirate FPS.) From Activision, we wind up with just one Call of Duty game a year. That's five in five years. 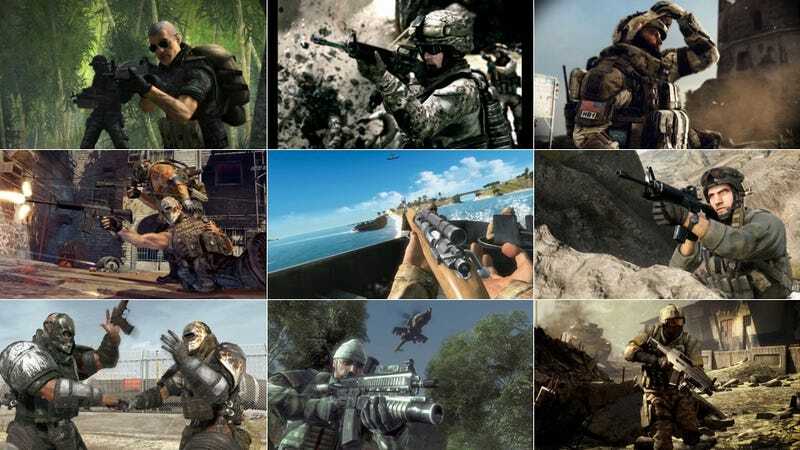 Add a few more if you want to count standalone portable games, but Activision still can't match EA's military shooter fervor. Man, why is EA so into making games like these? Any ideas?